Coal People is the most comprehensive and unique editorial blend of human interest and news in the coal mining industry both in print and online. Visit www.coalpeople.com and see why it has been favored by readers and advertisers for more than 33 years and is considered the industry's best read publication. Fairfax County Times is a local paper distributed in the Fairfax County area. Features include arts, entertainment, community, sports and more. 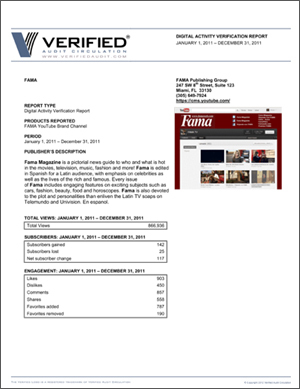 Fama Publishing Group has completed the first Verified YouTube Digital Activity Verification Report. The report covers the one-year period from January 1, 2011 through December 31, 2011. YouTube Brand Channels are a way for users to engage in a brand. Users can watch videos, add and read comments, subscribe, friend and share a channel with other users. The Digital Activity Verfication Report includes metrics on Total Views, Subscriptions, Top Videos, Geographies, Demographics, View Referrals and Playback Locations sourced from YouTubes' Insight reports. Verified's CEO, Tim Prouty, said, "In this time of greater accountability, Fama is able to deliver independently verified YouTube activity data to advertisers and media buyers." Questions? Please call Verified at 415-461-6006. The Association of Alternative Newsmedia (AAN) is building out a kind of wire service to allow alternative news sites to share content with each other — and maybe make some money. The recently launched AltWeeklies Content Exchange lets papers like the Boston Phoenix, Minneapolis' City Pages or Oakland's East Bay Express swap stories, photos, video, or other interactive multimedia to bolster their coverage of national news. While AAN members will be able to use the material for free, outside news organizations — think newspapers, broadcast networks, or news sites — will be able to pay to license it. What AAN is trying to do is take advantage of scale — providing extra copy for its members as well as larger, mainstream outlets that don't have the time or resources to cover the issues the weeklies specialize in. If the program proves successful it would not only increase the amount of journalism readers are exposed to, but it could contribute to papers' revenues, said Tiffany Shackelford, Executive Director of the AAN. "From my point of view, in the news association space, which is a weird animal, I think we all tend to get excited about the shiny object or huge success story and aren't able to, or can't, give members somewhat basic and easy-to-use tools," said Shackelford. "That's what I hope this does." Shackelford said the exchange doesn't currently have set rates for content licensing; most prices will be negotiated on a case-by-case basis. If the program takes root, that could change, she said. 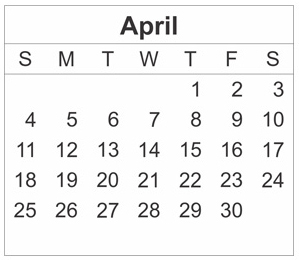 AAN members have free access to the exchange through the dues they pay to the group. 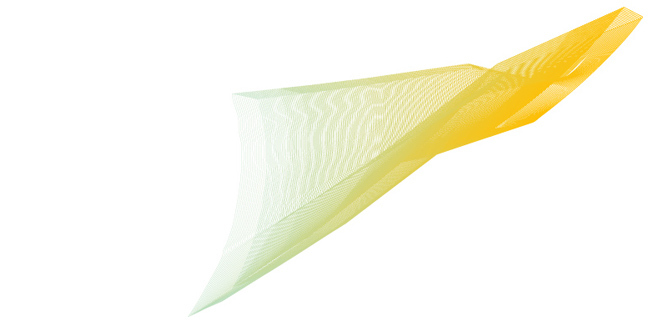 The exchange was built on Cont3nt, a larger system for connecting freelance media producers with news organizations. "This is an opportunity to get paid from larger news organizations," Shackelford said. "Think about things like Occupy in cities around the country, or the upcoming presidential election and the footage that could come out of that from smaller places that large organizations don't have the money to cover anymore." UPS members agreed to allow all other members to freely reprint their contents, to exchange gratis subscriptions with each other and to occasionally print a listing of all UPS newspapers with their addresses. And anyone who agreed to those terms was allowed to join the syndicate. As a result, countercultural news stories, criticism and cartoons were widely disseminated, and a wealth of content was available to even the most modest start-up paper. The need to share stories remains, but the tools have changed. (This content exchange won't operate via second-class mail.) Shackelford said the idea to create the exchange came from a desire to create a simple means of offering up the best work from weeklies around the country and make it available to their peers. Weeklies pride themselves on the time and reporting that goes into coverage that falls outside traditional media, and this is a way of promoting that work, she said. It's also a way to tap into broader stories or trends happening in the media. For topics like Occupy or the protests on changes to union laws in states, those stories have a component that plays on the local and national level. Another example would be features, profiles, or interviews of musicians or other touring artists whose schedule may take them from one alt-weekly community to another. Weeklies have faced many of the same challenges as their larger, mainstream counterparts in terms of circulation and revenue declines, and the content exchange could offer a means of providing additional stories at minimal costs. (If weeklies choose to take part: Many have chain ownership and already share content among sister publications; they may choose to keep that sharing in-house.) Still, Shackelford said her goal is to create a suite of tools that will allow individual weeklies to use the network to improve their bottom line. Shackelford said the AAN is launching an ad exchange. If the exchange takes off, and traditional media or other websites develop an appetite for the alt weeklies work, Shakelford said she could imagine the AAN taking steps to become a more formal content network by packaging material from members and syndicating that curated work. Among newspaper publishers, the rise of digital has already rocked sales departments. According to new findings from the Pew Research Center, however, salespeople have more in store. 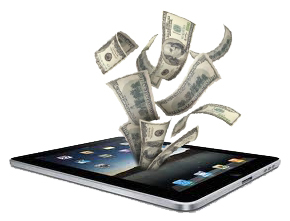 While consumers continue their digital migration, online revenue has yet to make up for print losses, Pew found. For every $7 in print ad revenue declines, newspapers only generated about $1 in new digital ad sales. "To accelerate the transition to digital revenue, executives at nearly all [surveyed] newspaper companies agreed on one thing: Their advertising sales staffs needed to change," said Tom Rosenstiel, Director of Pew's Project for Excellence in Journalism. Among some 38 newspapers, executives unanimously confessed to a continued need to retrain and retool sales staffs, which had been trained to sell print advertising. In data and interviews, Rosenstiel and his colleagues learned how the effort to change the culture of the business side of the newspaper industry involves everything from hiring digitally skilled salespeople to retraining staff to changing the compensation for staffers that generate revenue. "The significance of these efforts cannot be overstated," said Rosenstiel, citing numerous executive interviews. Unfortunately, at nine of the 13 companies participating in Pew's study, executives indicated that they had experienced difficulty recruiting digitally fluent ad salespeople. One reason was the perception of newspapers as a deeply troubled business. Also, executives said they were still trying to figure out how to best integrate digital-only salespeople with their traditional sales personnel. In small markets in particular, digital sales staffs may have an even greater challenge, because they need to explain why digital advertising is important to potential advertisers. Most executives still expressed a desire to handle this transition internally – rather than turning to outside companies to help sell its digital space. On average, 88% of publishers' digital ad revenue came from their own staff – as opposed to outside sales networks, according to Pew. Of the papers that provided data, 33 reported that they were putting a priority on hiring digital salespeople. This was even true at almost 90% of the smallest papers – circulation under 25,000. In addition, 84% of all the papers that responded said they had instituted a formal digital sales training program at their papers. Similarly, 89% of the papers that provided data have changed the way they track and evaluate the performances of their staffs – and three-quarters (76%) said they had changed how they incentivize and compensate their sales staffs. Still, most papers are still largely print-first operations, Pew notes – or, at least, print and digital together, when it comes to the composition of their sales staffs. "Salespeople concentrating largely on digital are a distinct minority," according to Pew. On average, papers deployed the largest percentage of their sales staffers – about half of them – to primarily sell both traditional and digital advertising. Meanwhile, about a third of the sales staff primarily sold print ads. The fewest number of reps – about one-tenth of the sales staff – were primarily selling digital, Pew found. On average, of the papers studied, papers had one digital ad rep for every three print ad representatives, while just four of the papers reported they had at least as many reps primarily selling digital as print. Below is a summary of Verified's revised guidelines regarding pre-populated demographic data. Unless otherwise specified, the changes are effective immediately. During subscription requalifications, the interviewer may have access to previous years' demographic and qualification information. The interviewer may confirm name, address, title, email, fax, phone number and prior-year demographic information during the interview. During subscription requests that are generated from a qualified association / group / directory list, the interviewer may confirm demographic and qualification information in the association / group / directory list. If SIC codes and titles are being converted to internal codes, VAC requests a map of the conversion coding for approval. The interviewer may confirm name, address, title, email, fax, phone number and list demographic information during the interview. If you have questions regarding these updates, please call Verified at 415-461-6006.